for the available Assistant Engineer (Electrical - Distribution and IT Network) Jobs on regular basis. Candidates who are interested to work with MPMKVVCL they can apply online for this Assistant Engineer vacancy. 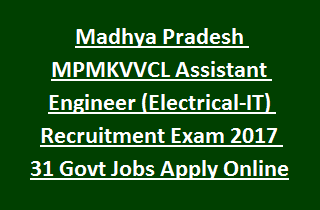 There are total 20 AE Electrical Jobs and 10 AE IT jobs available in this current recruitment of MPMKVVCL. Merit list will be prepared based on candidates marks in written test and interview. Online applications will be accepted online for this MPCZ Assistant Engineer Electrical jobs through mponline.gov.in website from 16-10-2017 to 31-10-2017 and for AE IT Jobs 26-10-2017 to 10-11-2017. More details are given below for this MPMKVVCL recruitment of AE Distribution Jobs. Click here to see the official notification of MPMKVVCL Assistant Engineer (Electrical) Recruitment2017. There is total 31vacancies in this MPMKVVCL recruitment. Age limits are 21-40 for General Male candidates and for all other of MP State upper age limit is 45 years. Candidate must have qualified B.E/BTech in Electrical or Electrical or IT or Electronics Engineering from a recognized university with at least 60% of marks. For SC/ST candidates 50% is required. For AE Electrical candidate must have qualified GATE Exam. The selection for Assistant Engineer (Electrical) will be based on written exam or GATE score. Initially merit list will be prepared based on Written Exam marks or GATE Score and those candidates will be called for interview. For AE IT jobs written test will be conducted by MPMKVVCL. For General Male fee is Rs.1500/-and for all others application/exam fee is Rs.1000/-. Candidates who are qualified B.E/BTech in respective engineering stream they can apply online through Mponline.gov.in from 16-10-2017 to 10-11-2017. Before submission of application must read the official notification which is available in mponline.gov.in website. It is mandatory to provide the valid communication details. Click here to apply online for Assistant Engineer (Electrical/IT) Recruitment 2017. Click here to see the official notification of MPMKVVCL Assistant Engineer (Electrical) Recruitment 2017.